Realistic green face witch mask, wonderful props for Halloween and Cosplay! 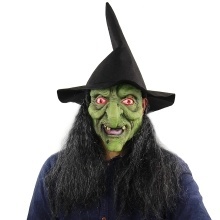 Scary green face witch, designed with hat and hair. Suitable for Halloween, costume party, April Fool&apos;s Day, etc.